Deeply rooted in place, Land Art (Telling Trees) is inspired by a large-scale fire that tore apart the island of Samos, Greece — the birthplace of the artist. Koutsouras first approached this theme in 1994 after a fire destroyed much of the vegetation on the island. When a massive fire again hit Samos two years ago, he returned to this theme and finished the work he started 20 years ago. Koutsouras envisions the white trees he painted juxtaposed with the black landscape as a visual reference to the act of fire. He shares that his objective was, from the beginning, to talk into the people’s consciousness and show the force of the action. Koutsouras wanted to do more than just create an image. This was a work in progress over several years, starting with a spontaneous reaction back on time. 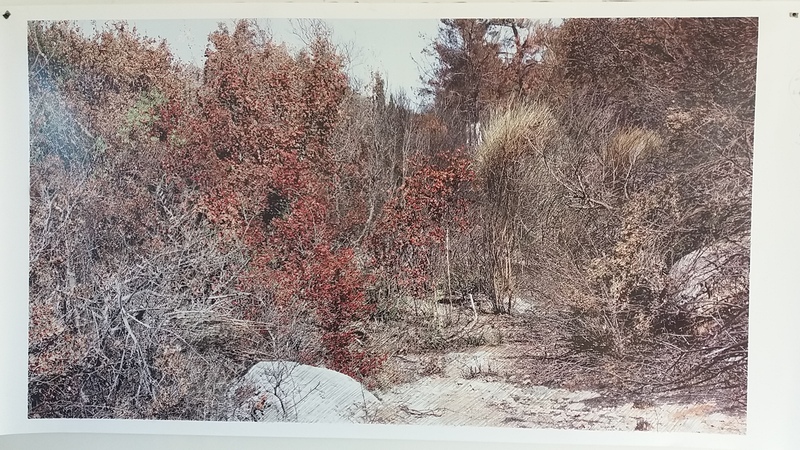 Land Art (Telling Trees) includes large photographs manipulated by Koutsouras in different ways. Some pieces are painted on, others drawn upon with pencil, and some left intact. The work captures the destruction and rebirth of the forests and fields of Samos from fires that swept through the landscape. He created other works by wrapping paper around the burned trees of Samos and rubbing charcoal imprints. The exhibition also ties Samos and Indianapolis (two places Koutsouras has lived at different times throughout his life) together with a sculpture made from two pine trees from the west side of Indianapolis blown over by straight winds. The 40-year-old trees were saved from rot or becoming mulched by Indy Urban Hardwood. The upstairs video room features a documentary about Koutsouras and other Greek artists by filmmaker Dia Kontaxis, a professor at the University of Miami. Her work has screened at museums, galleries and festivals including Venice (Art Biennale), New York (Tribeca Film Festival), Montreal (Art Fifa), Paris, Athens, Ankara, Lleida, Taipei and Miami (Art Basel). In another video piece located in the monitors outside of the video room and downstairs, Koutsouras paints the charred trees white to contrast with the blackness of the landscape. Koutsouras, who studied painting in Germany, often pulls from the instruction of an inspirational teacher and tries to make each work into its own narrative. Each piece must have a beginning, middle and end. The result in this show: a story of the destructive and restorative forces of nature. The exhibition was made possible by The Efroymson Family Fund, Managed Health Services – MHS, Sun King Brewing Company and Indy Urban Hardwood.